One of the things my health care provider does is classes of all sorts. My daughter and I took several last year about cooking and foraging. 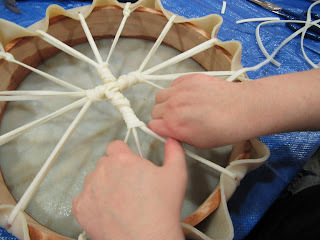 Yesterday, William, The Amazing Turnip Girl and I took a drum making workshop. The classes provide many things. A sense of community, information for life, a bit of philosophy, a sense of history that is not specific to any one People up here, but ties together things that the various groups and cultures have in common. A sense of respect. While we were in the waiting room, waiting for him, I saw him come in. He stopped to talk to people he knew who were in the waiting room but not necessarily there for the class. He laughed easily. He was wearing a beaded vest and a long delantium shell necklace. He moved quickly, but stopped often and took his time to notice people. When the class started, he talked about how drums were something universal. That cultures around the world had made them. How it's the heartbeat of our People, all of them. How we move towards drumming because our hearts are already there. My children smiled. They've been watching me move towards the drums their entire lives. They've seen me move unerringly towards the sound even before we are close enough to really hear it. He said that when we made them, we had to be happy, at peace. 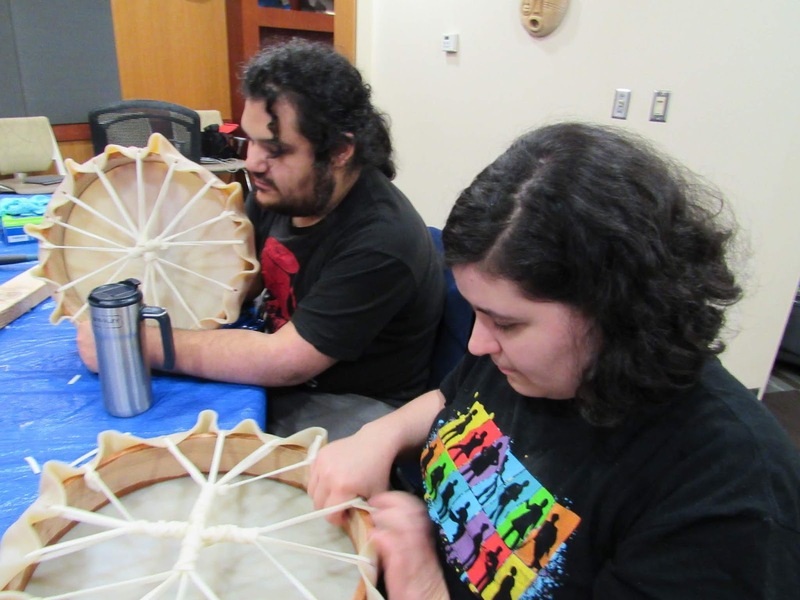 Because the drum would keep that feeling, and when we were unsettled, it would give us that feeling when we drummed. Once the making started, it went fairly quickly. 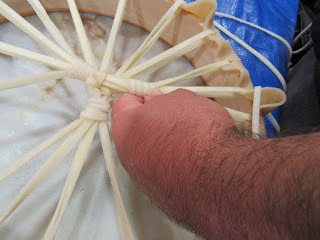 The forms were pre-made, so it was about cutting and stretching the skin and lacing it into place. Mr. Harrison was incredibly patient, and made jokes, made it comfortable. He emphasized over and over that mistakes, as long as the skin was stretched the right way, could be worked around. Obviously practice, as in anything, makes you better. You learn how materials work together. We made our drums. He told us to work the edges while they were drying, and all 3 of us have been doing just that. I watched TATG working the edges with one hand while she was reading her favorite Twitter feeds yesterday. When the workshop was over, I asked them "Are you feeling happy?" and they were both quietly enthused, proud of what their hands had accomplished. Urban Natives, especially those who've grown up distanced from their culture, can feel misplaced. Not a part of the larger culture around them, not in touch with the history or culture of being Native, whichever Nation they belong to. Programs like this help. It may not be a drum made the same way as our own ancestors made them, but we know our ancestors used drums. We know they heard drums made in a similar fashion. And these, imperfect though they may be, are our first drums that we made with our own hands. I'm very grateful for these programs. Thank you Southcentral Foundation for providing them. Get your button gear (coloring page)!